I tried to talk about Demo , but somehow I ended up talking about Spider-Man . Demo , by Brian Wood and Becky Cloonan (and published by AiT/Planetlar), is superhero comics distilled down to their basic essence. 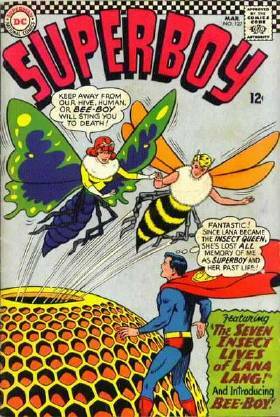 Each issue features a self-contained story focused around one character and his or her unique superpower. In most cases, the power serves to alienate the person from friends and loved ones (such as the girl in issue #2, who, like Preacher 's Jesse Custer, can make people do whatever she says...people she tells to drop dead do just that), but in at least one case (the girl in #3) that power serves to tie her in more closely to her family. And that's pretty much what each issue is about...how each character's unique problem separates him or her from society at large. There's no crime-fighting as such (though it could be argued that the super-strong fellow in #4 does just that)...just screwed-up people with screwed-up lives trying to cope as best they can. What I like most about these stories is that they are self-contained...had these comics been published by Marvel (as, with a little finagling, every one of these characters and situations could have been right out of the X-Men ) these stories would just be the first chapters in ongoing serials. For example, the telekinetic girl in #1 could be on the run from the law and her mother with her boyfriend, staying one step ahead of the feds, etc. etc., for issue after issue...but doing so would add nothing to the emotional depth and impact of the very first story. If there is more to any of these characters' stories, it's left to the readers to infer those stories on their own, rather than having everying spelled out for them. Think about Spider-Man. How was Spider-Man improved after his first appearance in Amazing Fantasy #15? That story is quite possibly one of the most perfect superhero origin stories of all time...the 1960s cartoon couldn't screw it up, Sam Raimi couldn't screw it up, and had they ever bothered to show it, even the Electric Company couldn't have screwed it up. Spidey learns his lesson about Great Power Bringing Great Responsibility, and he spends the rest of his life trying to redeem himself for his part in the death of his beloved Uncle Ben. The End. Every Spider-Man story after that dilutes the original...well, okay, I'll give you the Ditko issues, but once we get into the endless crossovers, the 300th battle versus Dr. Octopus*, clones and more clones, and, for the love of Pete (Parker), undermining the very raison d'etre of the character with some Dr. Strange-imposed afterlife encounter session between Spidey and the aforementioned late Uncle Ben...time did Spider-Man no favors. Not to say that there haven't been any good Spider-Man stories since the origin, but what really has been added to the character that you didn't already know at the very beginning? Getting back to Demo ...Wood's writing is nice and lean, while Cloonan's clear, manga-esque artwork carries the stories nicely. The superpower "gimmick" for this series only really gets in the way once (in issue #3, as while you're supposed to be paying attention to the emotional conflict between the young lady and her half-brother, you keep waiting for the superpowered-shoe to drop) but that's a minor quibble. Also, it's a $2.95 comic that feels like a trade paperback...each issue is a standard 32-pager, but the paperstock of the cover and the interior pages is so thick and meaty that you could probably stop a bullet with the darn thing. Plus, there's extra content in each issue in the form of notes from Wood and Cloonan, which include "mix-tape"/soundtrack suggestions for the comic, interviews, sketches, previews of the next issue, and so on. You certainly get your three bucks' worth. Recommended to people who like a little emotional content with their superhero comics, and possibly to people left out in the cold when Grant Morrison left X-Men . * Expect Marvel to double that number by the time Spider-Man 2 comes out. As you may have read here (among other places), there has been a death in the Gasoline Alley comic strip. And, as has also been noted, the cartoonist has been playing coy as to who it actually was that passed on...Walt Wallet or his wife, Phyllis. My prediction: it'll be a dramatic revealing of the tombstone that finally ends the mystery. It's my guess that it's most likely Phyllis who passed on...see, just prior to this sequence (which started a couple weeks ago) Phyllis revealed that she knew a secret about Skeezix and his adoption over 80 years ago, and no amount of cajoling from Walt would get her to spill. If she passed on before revealing the secret, then the next storyline would almost certainly be kicked off for a search for what that secret would have been. Or I'm completely wrong, and it was Walt. Heck, I'm just stunned by the fact that Gasoline Alley is even on a comics page somewhere. EDIT: According to an article posted here 1) the death will be revealed on May 5th, and 2) Gasoline Alley appears in 80 newspapers. 1. Special thanks to Ringwood for the very nice words about me and my little weblog-thingie here. 2. I still have a pile of AiT/Planetlar books to go through and review...hopefully I'll be able to get to another review by the weekend. 3. When's this going to happen on Smallville ? The long-awaited Superman #204 is out, and while most people are going to go ga-ga over Jim Lee's art (which, I suppose, is passable), the real star looks to be Brian Azzarello's script. Drawing a connection between Superman and religious themes is something that has been tried before, but usually in terms of Supes being worshipped as a god on some alien planet, or by some kind of earth-bound cult, or something. I don't think any relation has been made between Superman and Christianity before in the comics, so already it looks like Azzarello is attempting to try something different. This issue is all set-up, and the religious connection is only lightly made, so we'll have to see where it goes in future issues. Should make for interesting reading, assuming it is read and not just bagged and boarded or sent to CGC. Others: Uncle Scrooge #329 brings up a new (at least to U.S audiences) Don Rosa story, "The Dream of A Lifetime," that takes us through Scrooge's memories of his past, which is really Rosa's specialty. Abadazad #3, one of Crossgen's few remaining titles, actually made it out this week, and artist Mike Ploog is going all out on the crazy inhabitants of this imaginary land. The first issue of Steve Rude's regular Moth series is out, and looks gorgeous as was expected. We'll see if the story holds up. Planet of the Capes by Big Larry Young and Brandon McKinney also came out...it's as handsome as the other AiT/Planetlar books, and looks like a good read. Heck, you know it won't be bad. The latest issue of Chris Claremont and John Byrne's JLA seems to suffer a little in the art department...it still looks very nice, but it looks like Ordway's embellishment isn't as strong as in the previous issues, to the art's detriment. And again, I don't care what anyone says...I love Crucifer! The (almost) last hurrah of the good animated Batman series arrived this week in the form of Batman: Harley and Ivy by Bruce Timm and Paul Dini, and yes, it looks as good as you would imagine. I'm going to miss this particular line of Bat-books, the only Batman books that I've bought over the last ten years. And everybody seems to be having a conniption over Joe Quesada's Daredevil: Father ...well, I poked through it, and it doesn't look any better or worse than Daredevil usually does, except that Daredevil actually appears in it. What's the big deal? Is it because it's by Marvel's current Big Cheese that it's such an attractive target? I'm not trying to defend or attack it...I'm just curious. I would have picked up the new Essential Tomb of Dracula volume, except that we were drastically shorted on our order. Hopefully more will be in my hands by tomorrow...but my brief glance through the one copy we did get shows it to be just as attractive a package as the first volume. I've mentioned before that the only Essential volumes that look good at all are the ones featuring art by Gene Colan, whose work translates beautifully to black and white. Coming next week is Swamp Thing #3, and while it's still entertaining and well-done, one can't help but feel like we're covering ground already travelled by Mark Millar at the end of the second Swamp Thing series. Swamp Thing's too powerful for his own good, he must be stopped or humanity is doomed, Constantine is playing people against him, and so on. It's good, but I hope the series moves in its own direction soon. Also took a look at next week's Uncanny X-Men by Chris Claremont and Alan Davis. Well, it sure looks nice...Davis is a wonderful superhero artist, bringing a sense of whimsy to the proceedings that you rarely see in something as deadly earnest as an X-Men book. However, the writing looks like more of the same-old same-old...if you hated Morrison's X-Men , this comic is for you. For example, one character actually uses the line (paraphrasing, maybe...don't have it in front of me) "I have ways of making them...talk." Had this line appeared in Morrison's run...there would have been ironic self-awareness, or sexual tension, or some kind of other undercurrent to the dialogue. Here...this cliched line is very plainly meant to be taken at face value, as a "dramatic" revelation of this character's skills and abilities. It looks like the X-books are well on their way to feeling once more like you're reading someone else's mail...you're reading a whole bunch of names, you're reading about what all these people are doing, but you have no connection to them whatsover. Oh, and the White Queen, Sage, and Bishop are boring again. But you knew that. * I can only imagine the kind of search engine referrals I'm going to get now. Apparently Hal Jordan is coming back as Green Lantern. So who wants to join my new group, D.O.R.K. (Demanding Our Returned Kyle)? 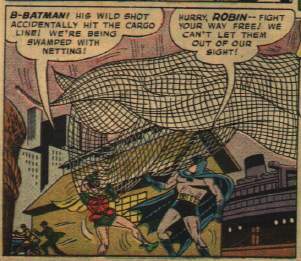 Robin's incredible observational skills continue as he witnesses Batman, unconscious, plunging in the river. The faithful ward dives in after Batman, searching the harbor bottom as best he can...until he realizes the inevitiable. Wiping a tear from his masked eye, he laments: "Batman...gone! I've lost the greatest friend I ever had? 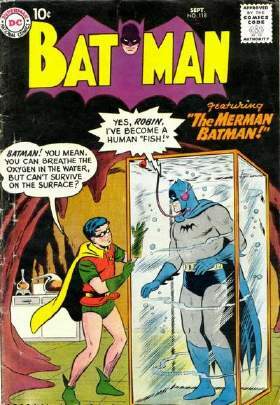 How -- how can I tell Commisioner Gordon...the people of Gotham City?" 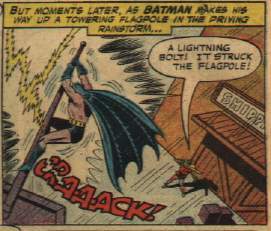 His sorrow is shortlived, as he suddenly receives a morse code signal on his belt radio...Batman is alive! 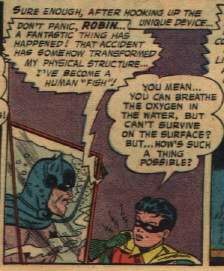 Robin's sorrow turns to confusion, though, as Batman relates some very strange instructions to his partner. 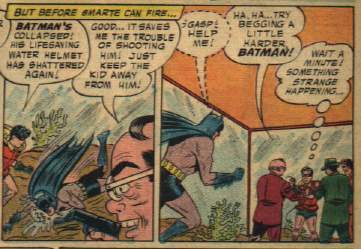 Robin hauls Batman, tank and all, into the back of the truck and heads back to the Batcave (hopefully taking little-used side roads to spare Batman the embarrassment)...once there, they examine their one clue to Kenton's whereabouts (the card, remember?). 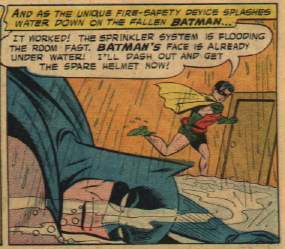 Robin: "Gosh...you mean you felt yourself returning to normal, and couldn't breathe in the water-filled helmet, Batman?" 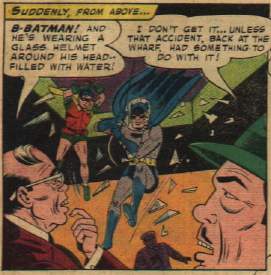 Batman: "Right...so I took advantage of the situation by pretending to be suffocating in the air!" So once again the day is saved by improbable science, spoon-fed clues, and plain old dumb luck! Gosh dang it...I have a review of Jax Epoch and the Quicken Forbidden that I was going to post once I, well, finished writing it, and then Ringwood has to go and put up a review that about ten times better than the one I was working on. I am happy to note that he picked up the same slight connection to another cartoonist that I did (look in the comments section of that review to see what I mean), but that means I have to cook up something drastically different for my eventual review. Rats. Well, here's a short review until I can come up with somthing better...the book's good. Reminds me a bit of independent comics of the early-to-mid-80s. It would fit side-by-side on the rack with The Realm, Trollords , and Zot! . The heroine, the very oddly named Jax Epoch, is smart and nuanced, the art is clear and straightforward, making the crazy events in the story easy to follow, and I don't think I've seen character motivation boiled down as succinctly as this: "Can't explain, better run!" I liked it, Ringwood liked it, and you'd better like it too, or Ringwood and I will team up and chase you down. Couscous Express by Brian Wood and Brett Weldele has been a consistent seller at our store...it's seems I'm ordering more copies every week, and yet, despite its high sales, I really had absolutely no idea what it was about. As I've mentioned before, I don't have the time or money to read nearly as many comics as I used to, and that means I'm probably missing a lot of good stuff. I'm sorry I missed this book for so long. Like Last of the Independents , it's a simple and fast-paced story, an action movie with just enough depth to the characters to keep the story moving. Olive is a sixteen year old girl who delivers food for her parents' restaurant, and finds herself stuck in a battle to protect her family from her mother's ex-boyfriend and the group he leads, the Turkish Scooter Mafia. Who would have thought those three words, put together in that particular order, could bring such joy? It sounds nuts, but it works perfectly in the context of this story. It's wonderfully absurd, and gives us an scooter gun battle action sequence that I'm fairly sure that we've never seen before. The writing is nice and sparse, edited down to just what is absolutely necessary. A nice bit of business is when Moustafa, Olive's "mercenary courier" boyfriend, is talking directly to the reader introducing himself and his thoughts on Olive, he's interrupted by his business partner Special. Special realizes that Moustafa is speaking directly to the reader, and takes it in stride...you'd think that this would knock you out of the fictional reality of the story, but instead it emphasizes the B-movie it's-all-for-fun feel. It's tells you, look, here's the relationship/character exposition, let's just get it out of the way so we can get to the action. There is some level of emotional depth to the story, however...mixed in with the action is the real story of Olive's emotional growth. She begins the story hating her parents, believing they are dumping too much work on her and being tired of them telling her how easy she has it now compared to when they were kids. You know, typical angry teenager stuff. It's as she begins to fight to protect her parents that she learns that her "spoiled brat" attitude needs to be discarded in favor of a more mature perception of her family...though her brattiness seems to be more refocused than lost, aimed (in a deadly fashion) at her family's enemies instead. There's a unique look to the art...the characters are roughly delineated, but all are instantly recognizable. Characters and backgrounds alike are all heavily toned with zip-a-tone dot patterns, except for the first few and last pages in greytone. It's a nice look...takes a second to get used to it, but it is very appealing. An aside, about AiT/Planetlar's books in general rather than just Couscous Express specifically, though it applies to this book as well...pal Dorian did a little rearranging of the bookshelves at the store to make a mini-display of AiT/PL's releases, and he noted just how well-designed the covers are. They really grab the eye, and having a whole bunch grouped together is really hard to miss. The designs are simple and similar -- limited color, title printed on a solid color or black stripe background -- but they're really attractively done. Quite a switch from looking at the superhero comics rack. Altogether, it's a nice package...sharp writing, attractive art, and a unique setting and plot...and, not to mention, the Turkish Scooter Mafia. How can you go wrong? 1. Since some of my fellow comics webloggers are taking this test, I thought I would as well. My results: "37.86982% - Major Geek," which should come as a surprise to no one. I also believe I should get extra points for a) having seen Spaceballs in a theatre, and b) running a comic shop. 2. Still working my way through the AiT/Planetlar box...I should have another review or two in the next day or so. Also, according to our invoice we should be receiving our copies of AiT/PL's Planet of the Capes this Wednesday (though, in recent weeks with our distributor, "appearing on the invoice" and "actually arriving at the store" don't necessarily always coincide).